…quite entertaining to contemplate that this could be true. Today while playing around with the new Apple Mail’s IMAP IDLE feature (which still doesn’t quit work I think) I discovered an interesting bit in the Preferences window. Apparently Google succeeded in placing a link to it’s own help page into the Accounts settings in Leopard’s Mail.app. If this is placed there by Apple or via an integrated feature that lets email providers include Help links there, is unknown to me. But still interesting and quite clever! 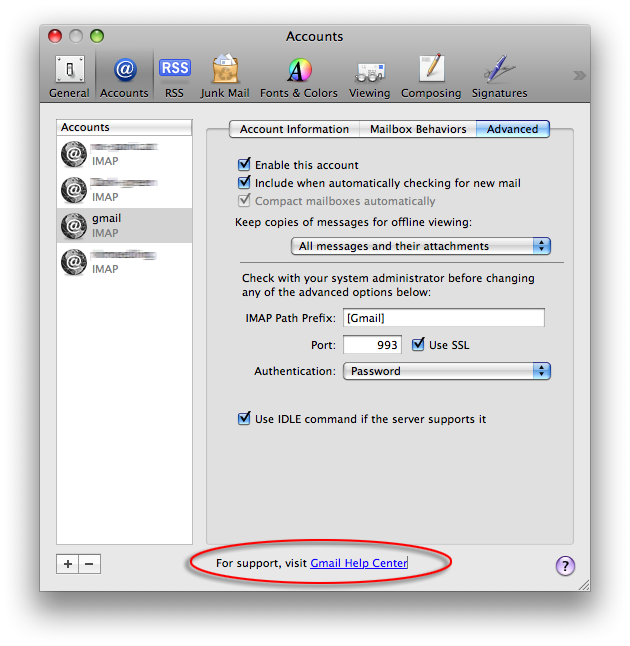 Apple Mail under OS X Leopard doesn’t support the GrowlMail Mailbundle which comes as an extra when installing the Growl notificaiton framework. Since I really missed that feature, that has been with me as long as I own a Mac, I searched around the WWW to find a solution. Wow, I guess I never got so many comments on one of my posts in such a short time. Thank you for participating and especially thank you for pointing out how to get rid of some of the points I listed in my previous post about Leopard quirks. Cmd+Shift+Tab still works – Apple merely removed the ability to cycle in the task switcher with the arrow keys. The other way still works the same. Thank you to all of the people who stated that! Mounted network volumes on the Desktop – Those can be enabled in the Finder’s preferences under “General”. Thanks to John and Bruno Rodrigues for guiding me in the right direction. Also re-read the previous post, I just added one more bullet concerning the iTunes Artwork screensaver. If you only remotely followed the spreading news around the net, you should already be aware of all the good things Apple’s new operating system brought us. So I’m just gonna sum up the few things that bug me the most. Just let me state that besides those, I really love the new things OS 10.5 Leopard provides me with. Lack of Bluetooth in Address Book – Why the hell did Apple remove the ability to control my cell phone via Bluetooth from the Address Book application? I just loved being able to answer and place calls and most notably send and receive text messages via a very integrated GUI application. I hate typing messages on my phone keyboard, so this was a really nice addition and I just don’t understand why Apple considered this to be a feature that should be removed. Cmd+Tab doesn’t cycle anymore – In all previous OS X versions, if you pressed Cmd+Tab to switch applications, you could go left and right. Meaning if you where at the first application icon on the left, pressing Cmd+Shift+Tab or Cmd+Tab and Left Arrow you where taken to the rightmost entry. This doesn’t happen anymore. The task switcher stops at the edges, which I find very inconvenient. Now it takes me a lot longer to reach the application I was aming for, most of the time. Network mounts not showing up – This one is still a bit confusing. The new integration of network shares in the Finder is quite good and works very fast. But network shares do not show up as mounted volumes on the Desktop anymore. The only way to get to them and eject them, is by displaying the “Comuter” item in the finder and clicking on its icon. Alas, there are all my mounted network volumes. If Apple didn’t want to clutter up the Desktop, they could at least let those Volumes show up in the Finder sidebar, like mounted DMGs. FrontRow stopping iTunes music – When entering FrontRow while playing music, it stops the playback and you have to navigate to the desired song again. Quite the show stopper when moving away from your computer but wanting to have a nice readable interface from the distance. iTunes Artwork screensaver has a red tinge – If you set the iTunes Artwork screensaver to more than 6 rows, which is necessary for widescreen displays to get rid of the black border on the edges, all the pictures suddenly have a reddish tinge. This is confirmed on two separate installs of Leopard on my MacBook and Ollis’s MacBook Pro. Update #3: Some quirks could be resolved via the comments (Thank you all!). Read my follow up posting.